Names of Lily Lolo pressed eyeshadows I’ve used: Voodoo, Truffle shuffle, Ivy League, Brassed off. On the face I’ve applied Lily Lolo BB cream Light. 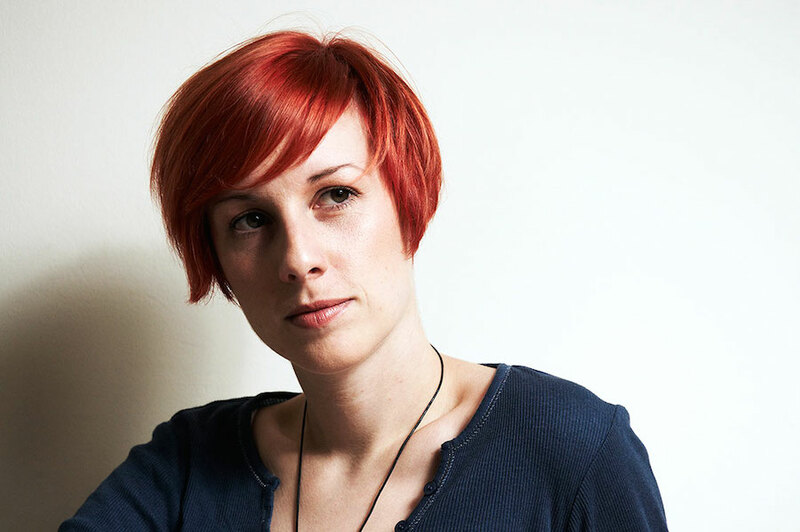 Special thanks to the model Maja M! It’s no doubt that one of the strongest makeup trends of this season were the statement lips in all shades of reds, bordeaux and we even saw violet lips. Violet it’s a special color that you can like or not (I like it a lot 🙂 ) and when worn as a make-up detail, it can be very bold and extravagant. It was seen on runway for spring 2013 at Haider Ackermann(left picture) and Bottega Veneta (right picture) as well. I will describe you how to recreate the look from Bottega Veneta, because it’s more wearable for most women. This look seems very classic and elegant at the same time. 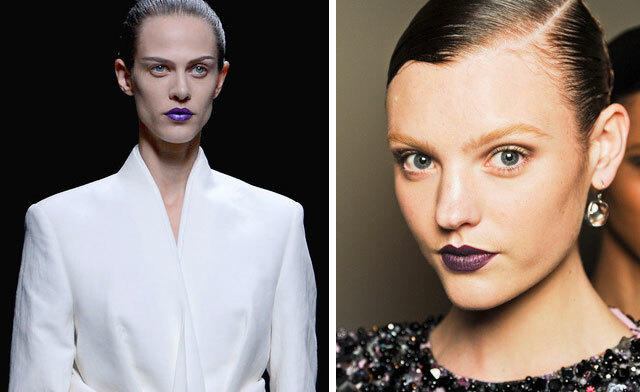 It also unite 2 trends for this winter: grey and violet! Depending on your skin type choose a foundation that will work best for your skin. 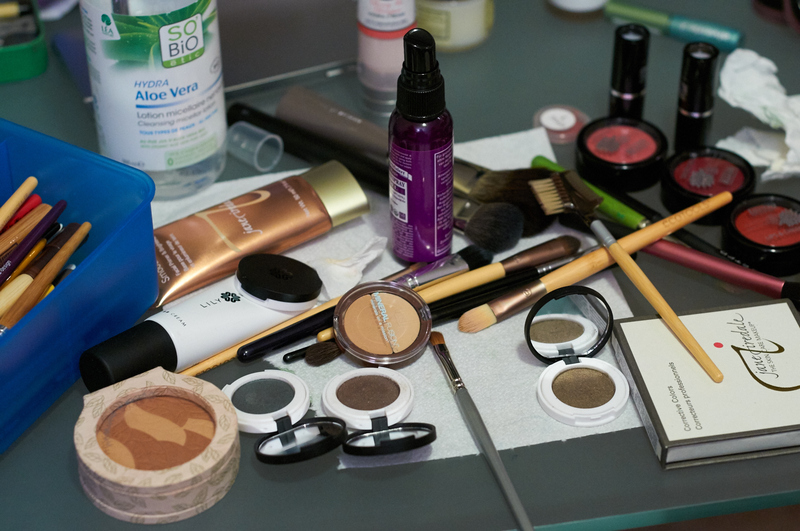 Learn more about how to choose your foundation here. 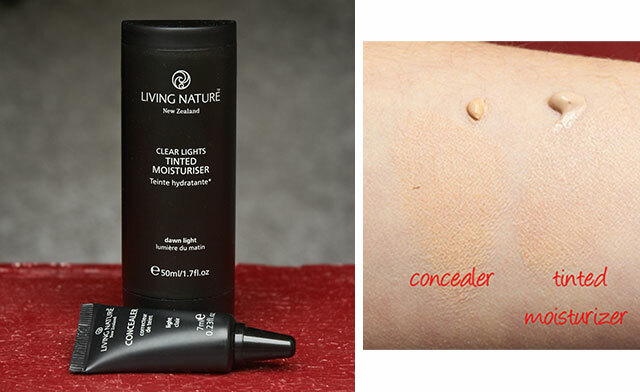 After having done a flawless canvas, use a concealer to cover any imperfections. 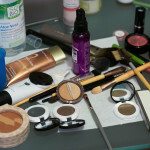 Set the make-up with a powder where needed. 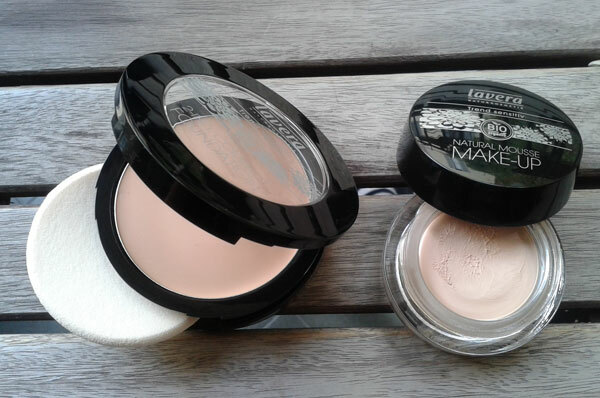 Don’t use to much powder; it will make you look too old with a cakey finish. 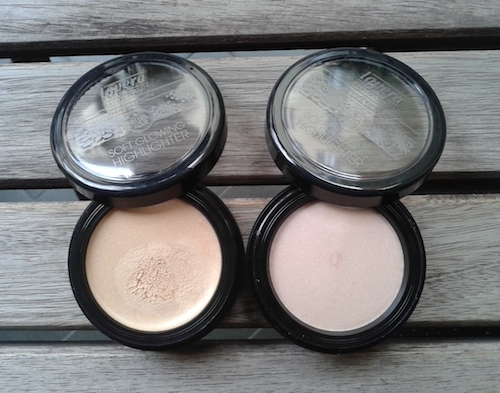 With a contour brush and a powder/compact foundation define your cheekbones. Put the brush underneath your cheek bone and blend well towards the ear to make a sculpted effect. 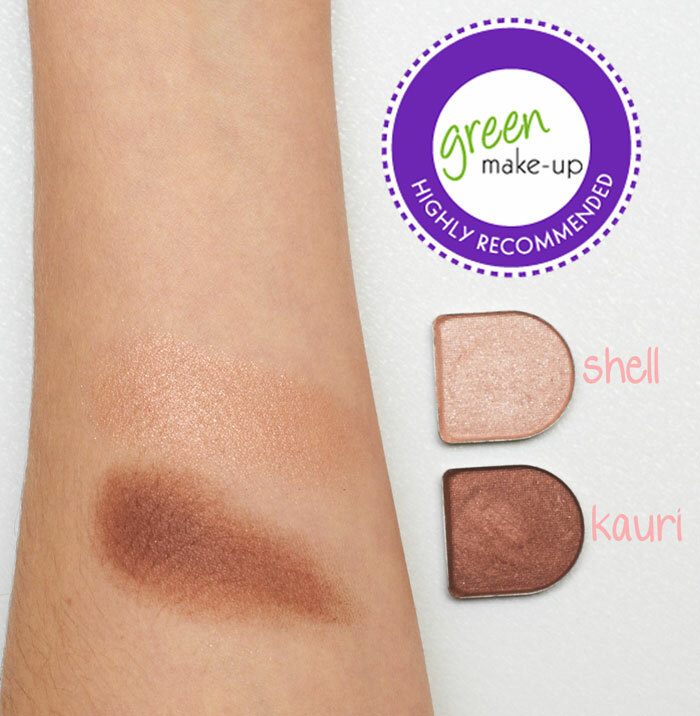 Use a matte shade of powder that is one shade darker than your skin tone. Blend well. 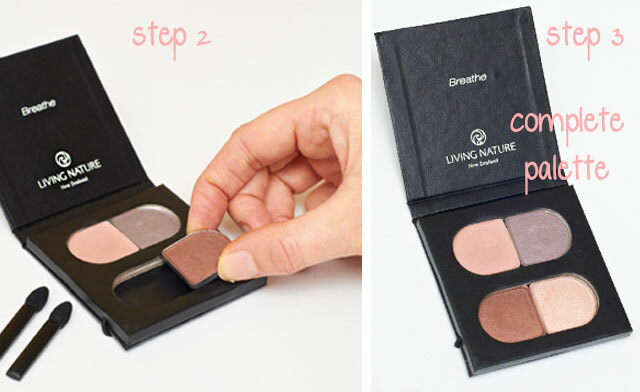 First apply a neutral light matte eyeshadow in a champagne shade on the entire lid to make an even base. 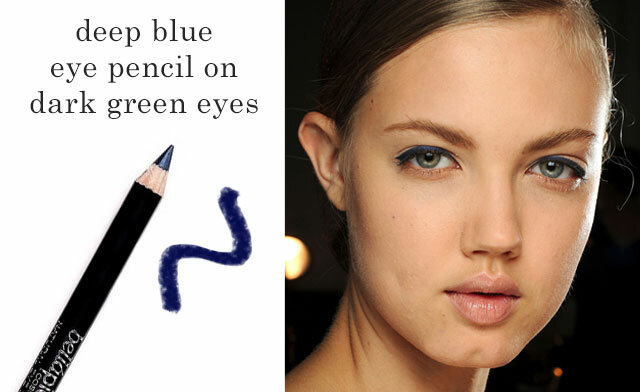 Use a large fluffy eyeshadow brush and blend well. 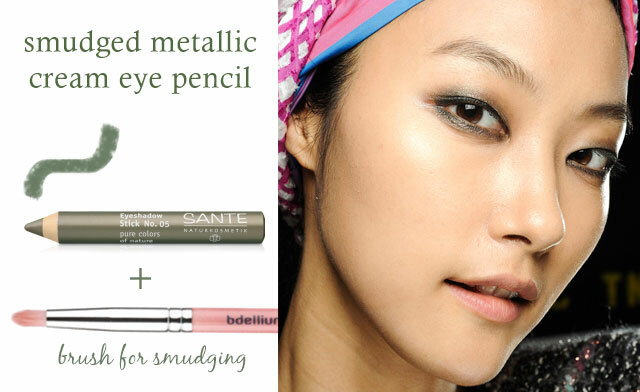 Then apply a shimmery metallic grey in the crease of the eyes and blend well, too. The best is to use a blending brush with a tapered end. 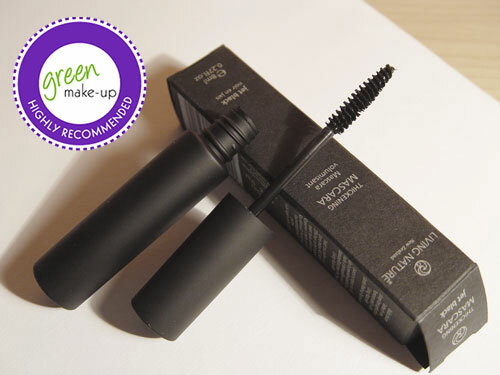 Curl well the eyelashes and apply a few coats of black mascara. 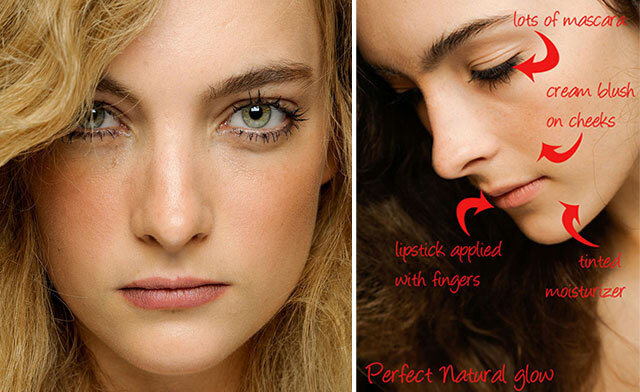 Line your lips with a lip pencil and fill them with it as well. This way you will make a good base for your lipstick that will last longer. Then use a lip brush and apply the violet lipstick on top. Blot with a paper tissue and repeat with applying another layer of lipstick. Set the lips with a touch of translucent powder. Green makeup tip Below are my suggestions for choosing the lipstick. For the violet color I have chosen Lavera lipstick n.3 in Berry violet – a rich plum shade that will look great on brunettes with brown eyes and yellow undertones. 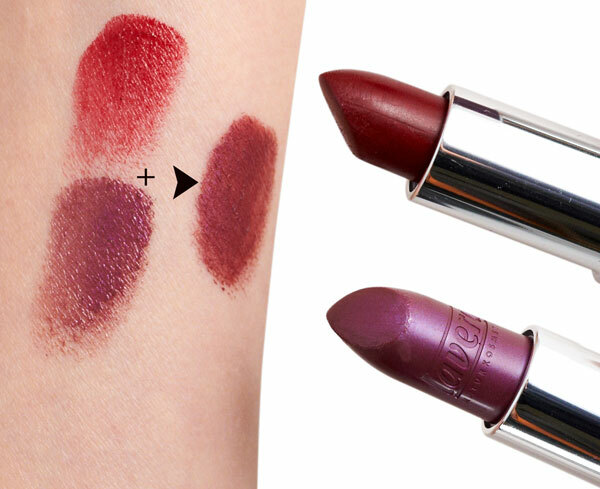 For those who don’t feel brave enough to choose a violet lipstick you can wear a true red. If you mix a true red with violet you will get a bordeaux shade that is very trendy as well. 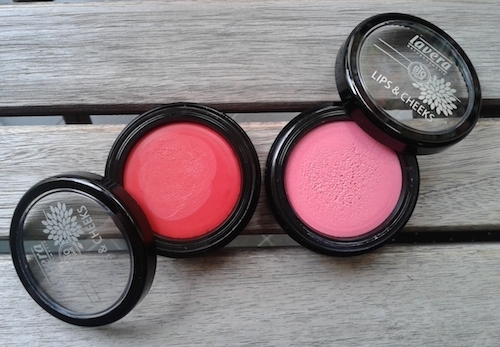 Read more about statement lips here. 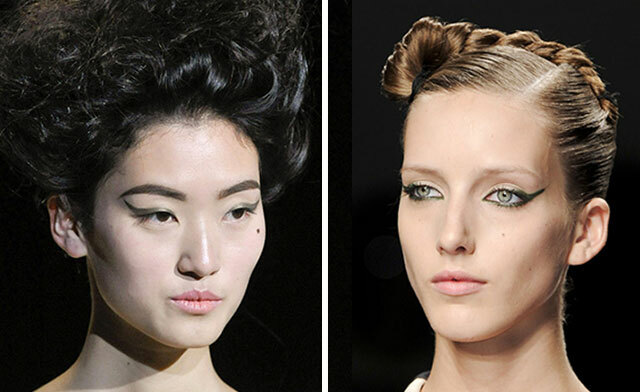 On the Bottega Veneta’s look the brows are bleached, which I don’t recommend to do on your own. Bleached brows are also an editorial look and so I advise you to shape your brows as naturally as possible and fill them slightly with a brow pencil in the shade of your hair. This look will look great especially if you will wear black: an elegant evening dress or a masculine inspired pantsuit. Hope you like the look and enjoy the last night of this year! 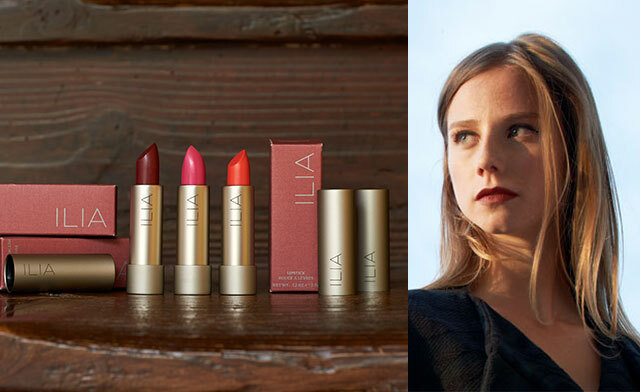 I wanted to try Ilia beauty, the phenomena of modern organic lipsticks with safe ingredients for a long time. I’m extremely happy that the opportunity came along when I met Floris and Ingrid, the founders of the German green beauty store called Amazingy. I started to collaborate with them and so I got the opportunity to try many new fantastic green products that I will present you all soon. Today, it’s time to present you Ilia Beauty lipsticks and give you a lesson about how to wear lipstick in a modern way. 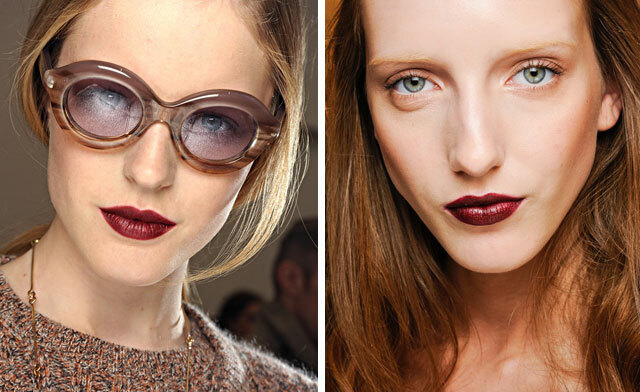 Don’t be afraid of new shades of lipsticks, vivid or darker, because you can wear them in different ways. 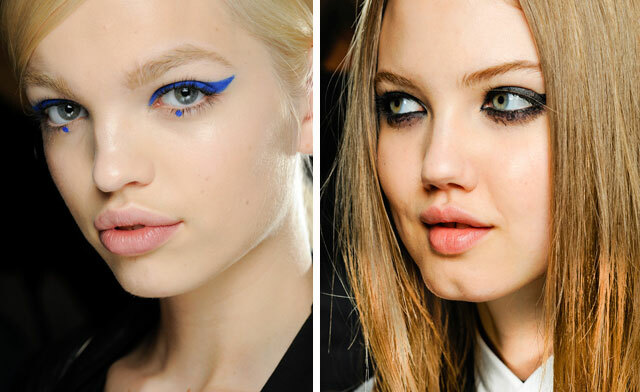 Modern times don’t command just one trend anymore, or in this case a lot of lip liner and color or just glossy lips. 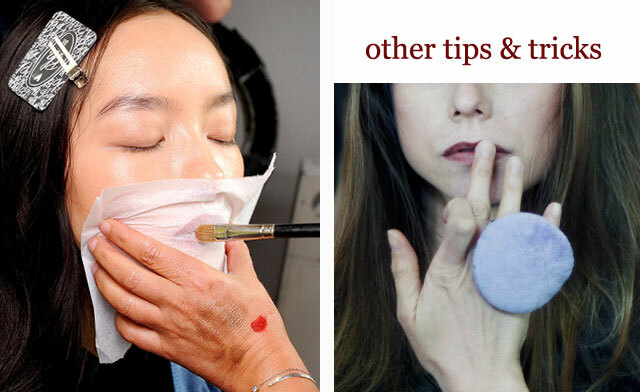 No, there are many and more subtle ways to use the colors and textures on your lips: for every woman her own style. Last seasons we saw many different ways to wear lipstick: from nudes, to dark reds and even bright colors as orange and pink and these trends still last in the upcoming seasons as well. Even though I mention the trends, at the end I recommend to find your own unique way that will suit your needs and make you feel great. 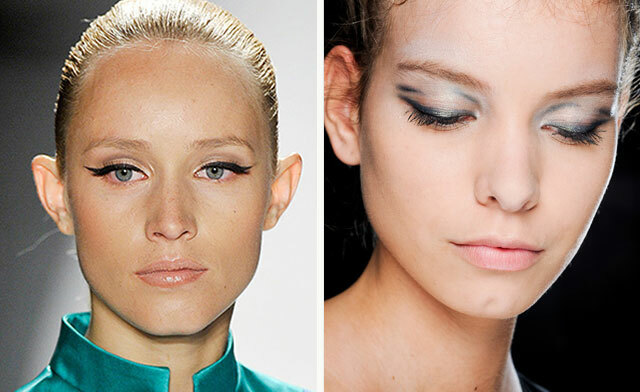 In the make-up and fashion the color rules aren’t so rigid as they were once. There isn’t one and unique rule anymore who can wear a color and why. 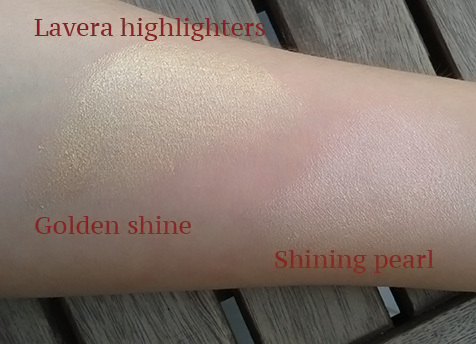 I have chosen to review 3 different colors from Ilia, but I will start with the darker shade and explain you how to wear and apply it. Every season you can see the different dark tonalities of wearing reds and this has already became a classic and not a trend anymore. In the pictures below I’ll show you step by step how I did the dark lipstick look and how I have applied it. I’m going to use the Ilia Beauty lipstick Femme Fatale, definitely the shade of this fall/winter season! It is a dark burgundy red that can be worn almost by every woman. It suits a blonde with pale skin as well as a dark woman with tanned skin. Even on those with red hair it looks amazing! What I think about ILIA beauty? 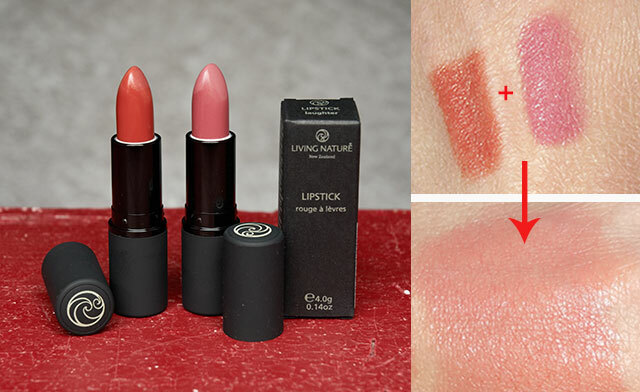 I was really very curious about these lipsticks, especially because many times some green brands enhance virtually the colors on the pictures and in reality you don’t get what they show you. With Ilia is a different story. Apart their beautiful package with a minimalistic aesthetic and luxurious metal lipstick pot, the colors are really what you see on the catwalk. I was wondering if the dark red will be dark red and it is! But I was mostly surprised when I tried Ilia beauty Neon Angel – a vivid pink magenta and Ilia beauty Voila – a bright, vivid orange. The 2 shades of orange and pink are a little bit more suitable for summer but they will also be a must for the next year as well. These 3 shades also work great all together because they mix together very well and so you can create even more custom blended lipstick shades. Most of all, I love their matte finish with a beautiful creamy (and not drying matte) effect. The texture is smooth, creamy, long-lasting and hydrating because of natural vegetable oils like sesame, jojoba, sunflower and rose hip oil as well as cocoa butter and aloe vera juice. 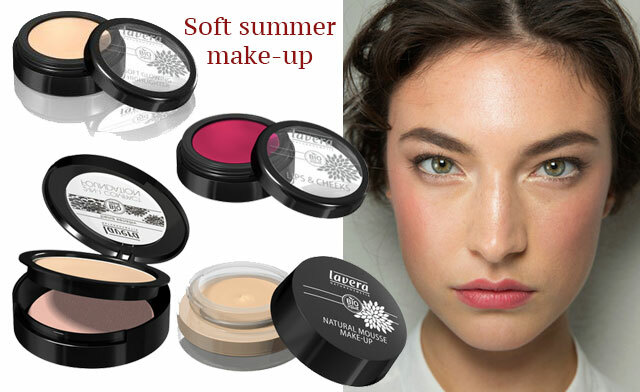 All colors are very modern which I really like and so Ilia is a must-have for my make-up kit. Another 2 limited edition lipstick shades + a totally new mascara all-to-try have been launched on the market recently. Take a lip brush and your Ilia Beauty lipstick in Femme Fatale (or any other preferably dark red shade of lipstick). Damp your brush in the lipstick and start applying it on your lips. Start in the center of your lips and distribute the color evenly from inside out. The brush allows you to distribute evenly and precisely the color and to build a few layers that will last longer. 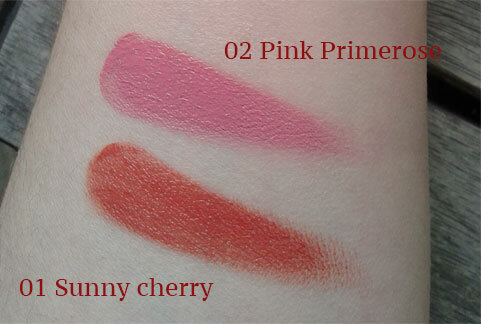 I suggest you to try HIRO lip brush in retractable travel version. It’s made from synthetic fibers and its shape is very precise. But I’ll come back soon with more info about this new brand that I discovered. 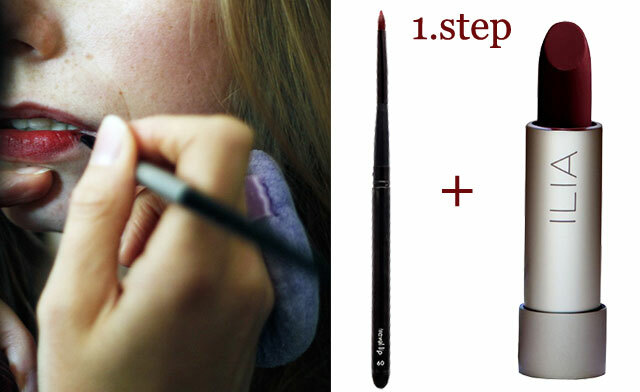 Just follow the natural shape of your lips with the brush to achieve a beautiful even red color and a nice contour. Usually we were taught to apply first the lip pencil because of the contour but this is not the case anymore. When you eat, your lipstick will fade away and what will remain is a line which is not so nice looking. 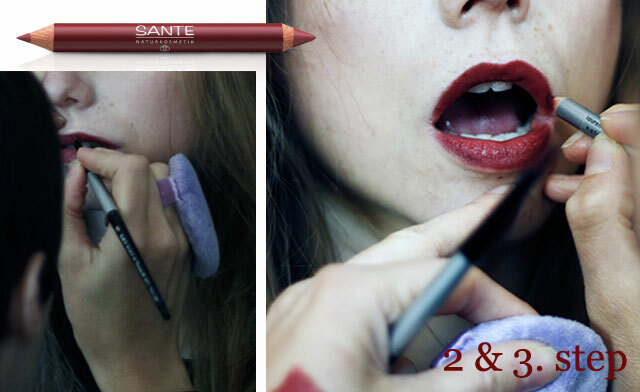 Instead, apply the lip pencil in the same shade on top of your lipstick to smooth the contour and make it very precise. This way you will fix the lipstick and it will last longer. I have used Lauren Brooke lip pencil in Vintage wine shade. Even Sante pencil n.3 will work well. Try this new technique and you will be amazed by the result. Blot with a paper tissue to remove the excess of color and then you can apply again another layer with a brush or just tap the color naturally with your fingers. This is a very fresh approach to wear lipstick. And you can use the same lipstick for your cheeks as well. Tone it down with a little bit of your foundation if needed and apply it on your cheeks. It will look gorgeous! I’d love to know how do you wear your lipstick? 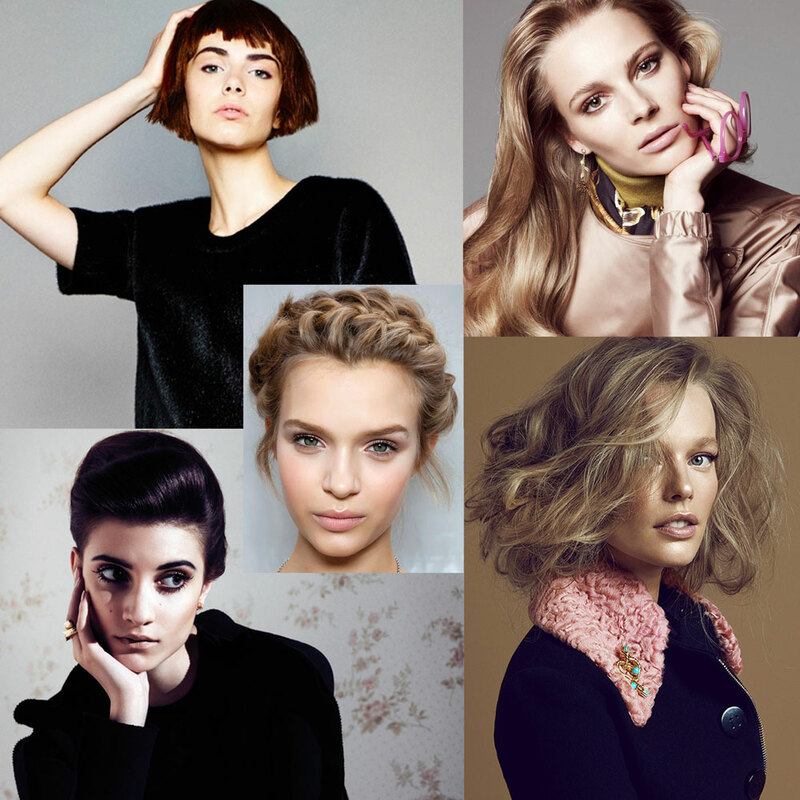 Are you tempted to try any new shades? 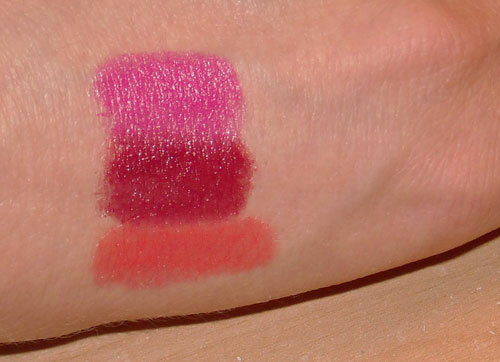 Special thanks to AMAZINGY shop from Berlin that gave me the opportunity to try Ilia lipsticks for this review. You are kindly invited to shop in their amazing green store that I like very much! This post was inspired by my blog’s avid reader Lynn (and even blogger herself – check her LovelyCosme blog) who was asking me how to choose a liquid foundation brush. Since I’m addicted to make-up brushes and love to experiment with them, I realized that this is actually a very good and not so obvious question, especially for a beginner with make-up brushes. The beauty market is full of different shapes of brushes and every brush has its own use, so I can understand it can be really tricky to find something that really works when someone is not familiar with the use of all these products. I’m especially happy that during this time, while I explained to Lynn about some brushes, she told me that she became an enthusiast of makeup brushes in a short time! So, in this post I will explain you some different types of liquid foundation brushes. As you can see from the top picture there are different shapes of make-up brushes for applying liquid foundation and they have all one thing in common – they are made from synthetic fibers (except Bdellium tools 953). Apart using a make-up brush for applying the liquid foundation, you can also apply it with a sponge or with your fingers, or even use a combination of both (fingers-sponge, brush-sponge,…). But this post’s purpose is to explain and present the foundation brushes. Personally and professionally I prefer to use a (clean!) make-up brush for applying liquid foundation. Sometimes, I also use the sponge after the brush to set and blend the foundation really good into the skin. I have also noticed during the time, that with the new generation of foundation brushes, I almost don’t use sponges anymore. 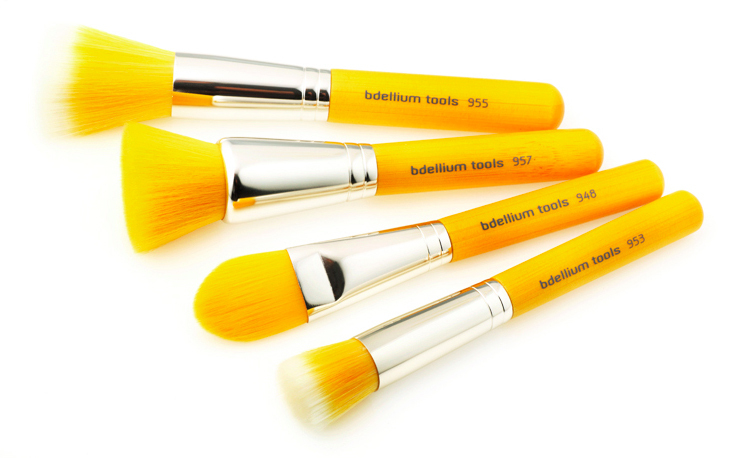 Coming back to the brushes, the most common and even the first designed brush for liquid foundation was oval shaped, like Bdellium tools 948 in the picture. However, the brushes with this shape vary from brand to brand and you should try the brush before, to see how it suits your needs. The biggest difference is in the stiffness of synthetic fibers. I don’t like brushes that have too rigid fibers, because they don’t slide on the face well, they can be rough and they don’t blend well the product into the skin and in every corner of the face. But even if the fibers are too soft (and the brush is flat), is not ok, because they won’t distribute the product evenly. The second parameter is the length and width of the fibers. The brush can be large (like Bdellium tools 948) or narrow (like Bdellium tools 947). If it’s narrow, it can reach small areas of the face, otherwise “the large” one is usually a common width for a liquid foundation brush. Another version of this same brush is angled foundation brush like Japonesque (on top right). This brush is designed with a tapered edge to precisely reach areas on the face like around the eyes or around the nose. All these brushes are flat in order to smear evenly the creamy/liquid product. is a modern version of the foundation brush that has been designed from Adesign. This brush is designed like the previous one to reach different parts of the face and it has also quite short bristles which is especially fine for under eye areas, chin and nose. 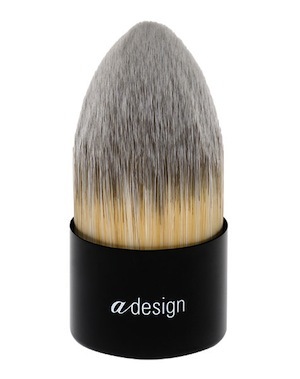 Adesign as well as EcoTools and some other brands have launched also the pointed kabuki brush. The difference from the flat pointed is its 3-dimensional shape and so it’s ideal when used with cream and liquid based products because it blends perfectly the foundation with no strokes left on the face. You also have more control when applying the product. or “duo-fiber brush” is quite a new generation and concept of foundation brush in comparison with the classic foundation brush. Many brands include them now in their collections not just because is great for applying foundation, but is also very good for applying all creamy products like primers, cream blushes, cream highlighter,…With this brush you achieve a flawless airbrushed look thanks to the mix of two fibers: natural (black color) and synthetic(white color). The technique for using this brush is called stippling, which in Fine Arts means to apply paint, powder, etc., (to something) with many light dabs. Usually, with this brush you apply the foundation (or other liquid products) with tapping/dabbing it gently into the skin without doing any strokes. You literally paint the face with some kind of dots. 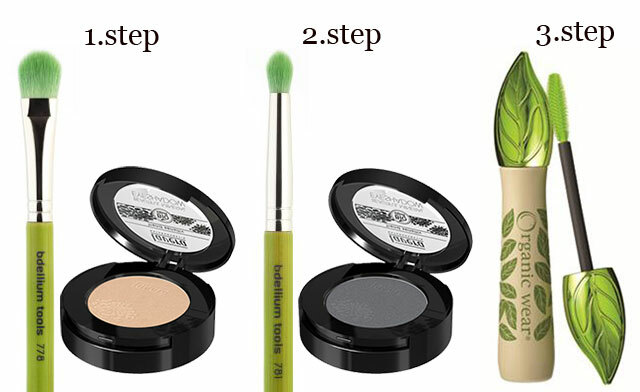 Even the cruelty-free brands have designed their eco-friendly duo-fiber brushes versions that work as well as the original version mixed with natural hair. They have 2 different types of synthetic hair (one is softer, the other is more stiff) which allows a perfect result. 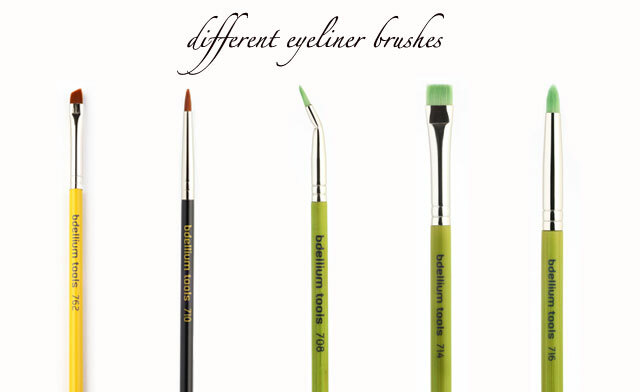 I really love the Bdellium Tools green bamboo line where they have some amazing duo-fiber brushes. NOTE: Attention, don’t mess with duo-fiber synthetic brushes that are just colored with 2 colors. This is not a duo-fibre brush! Duo-fiber brush has 2 different types of fibers which you can see and feel. One of the latest versions of brushes is also the buffing brush, which has evolved lately, along with the expansion of mineral make-up. 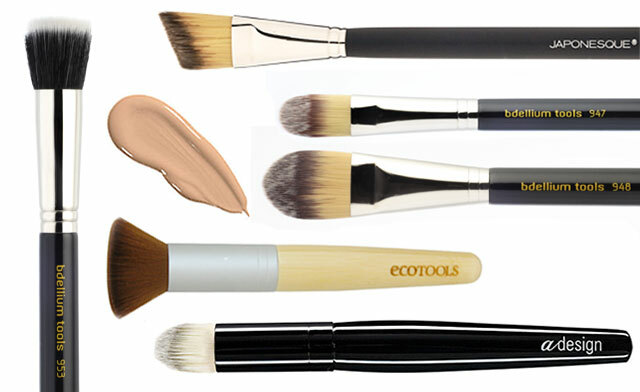 On the picture you can see an example from EcoTools, where the brush is very dense with a conical shape. 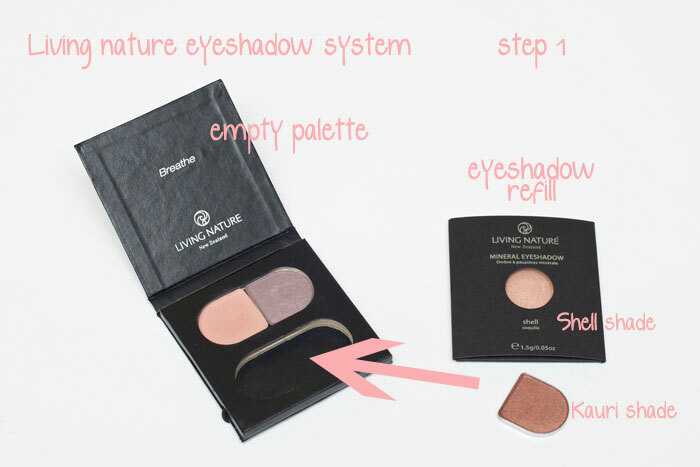 It has quite a large and flat surface to blend and buff the product into the skin. 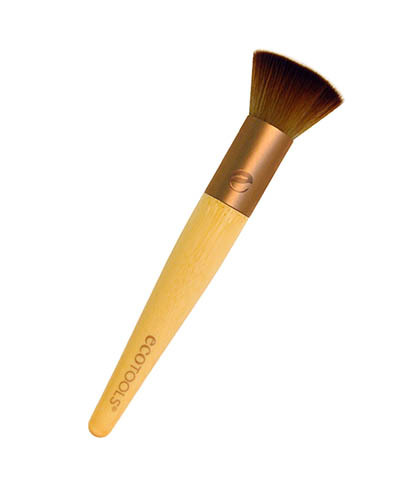 Originally, this brush is meant to apply powder products, but I also love to use it for applying liquid foundation. 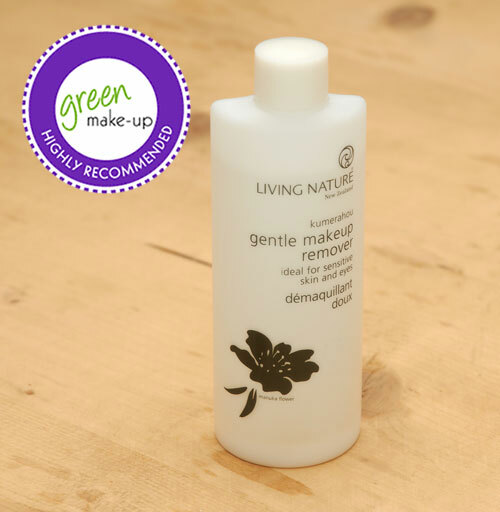 It works great, because it literally buffs the foundation on the skin, leaving a flawless smooth skin and a natural look. This is the entire range of different make-up brushes for applying liquid foundation. Which foundation brush to choose? As I mentioned before, these are the main shapes that vary from brand to brand in parameters such as density, width, shape, length and type of fibers. However, the choice which one to choose is not really easy for a beginner. I’d say to try before different shapes at least in the shop. Examine how do you feel the touch, how does it works, do you feel it’s too soft or too rigid, do you prefer a large or a narrow brush, which depends even on the size of your face (larger/smaller areas)? The choice of the brush depends also on the type of foundation you use. If you use dense almost creamy liquid foundations then I recommend brushes that are stiffer, otherwise you cannot pick, smear and blend the product good. 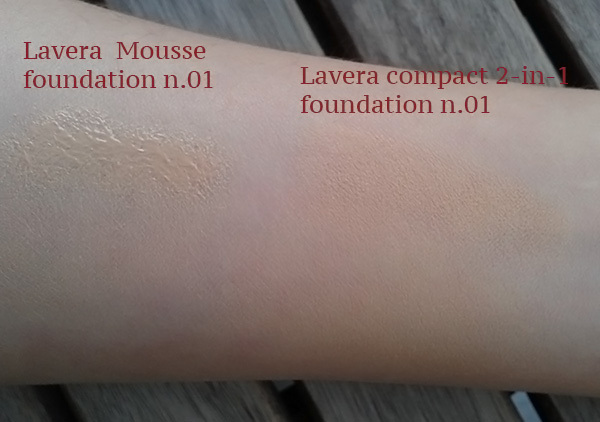 Contrary, if you use light foundations (like HD generation) then a stippling brush or a smaller foundation brush with normal fibers (not to soft not too stiff) will do a great work. Hope it was helpful and that everyone who is looking for a new liquid foundation brush will find its own! 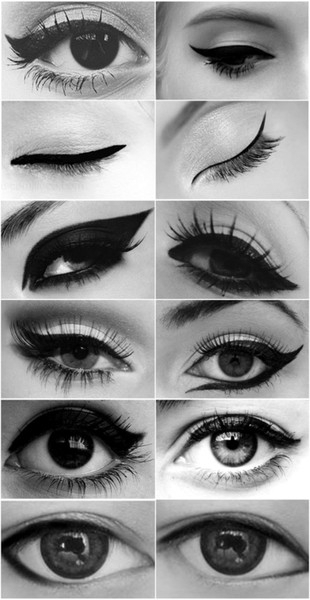 How to apply the eyeliner? 2. Don’t think that you should draw the entire line with one brush stroke. It’s really not the case. 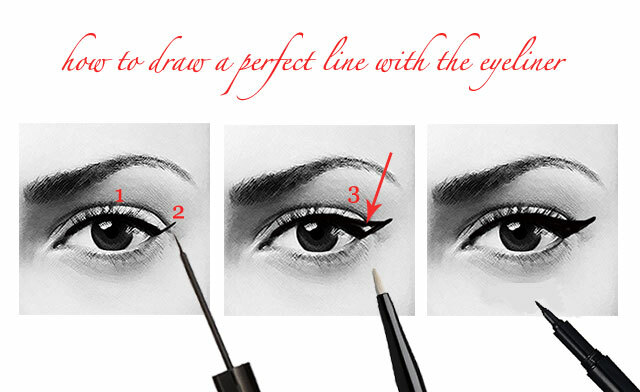 Instead, especially if you are a beginner, draw the line and the wing first with an eye pencil. You will have a guideline and you can also adjust the wings by correcting them if they are not symmetrical. Take a q-tip and correct, really easy. 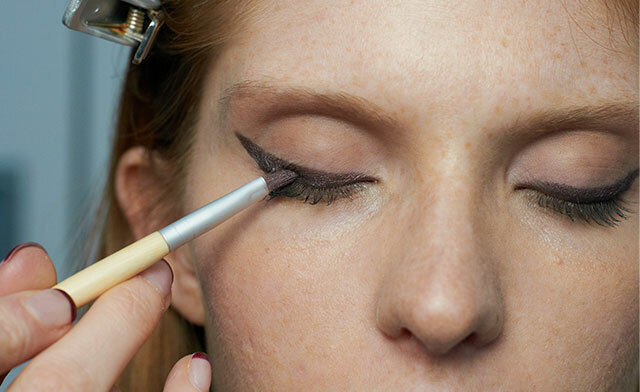 With a q-tip and a make-up remover you can correct even the wing of liquid eyeliner if needed. You see, there is a solution to everything! 3. Apply the eyeliner with small strokes and with a light hand. 4. If your hands are shaking, lean your elbow on the table, or on a surface to keep it steady. 5. 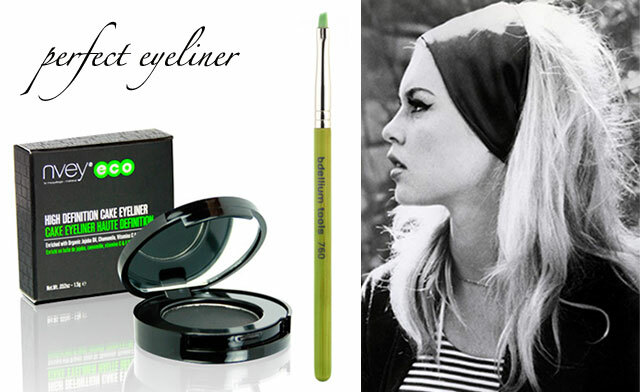 If you use liquid eyeliner shake it well before use, so that you won’t have a dry tip of the brush. The line should be liquid and smooth. 6. When applying any kind of eyeliner (liquid/gel/cake), draw first the line along the upper lash line and then also the wing (step 1,2). After having drawn the rough guideline, start to smooth the line and fill in the gaps between the lashes (it’s not good to see gaps of skin between the eyelashes) and design the triangle between the wing and the line (step 3). Finally, fill in the triangle with the eyeliner and connect all together. 7. If you choose to draw your line with a pencil, choose an appropriate pencil for the line you want to create. 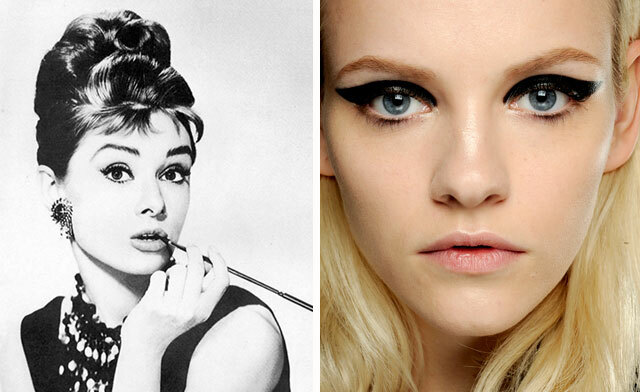 If you like a really thin line into your lashes, then choose a harder pencil and sharpen it good. This will help to create a precise line. If you want a thicker line or a smudged mysterious look, then choose a softer pencil, a kohl or a kajal because they are soft. 8. 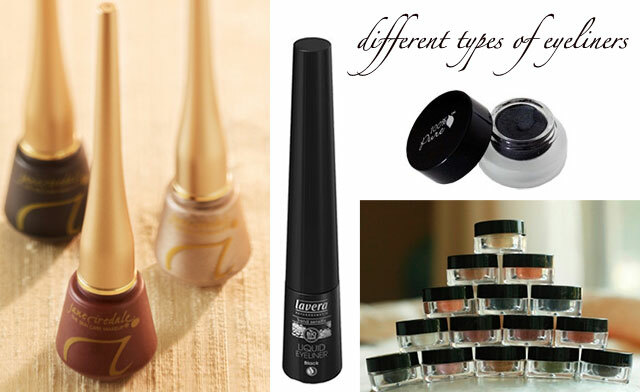 If you apply a gel eyeliner or you create an eyeliner from your pigments/eyeshadow, then choose a brush that will help you draw the line you want. Especially for the beginners I suggest using a thin and precise angled brush. This will also help to design the wing easily. 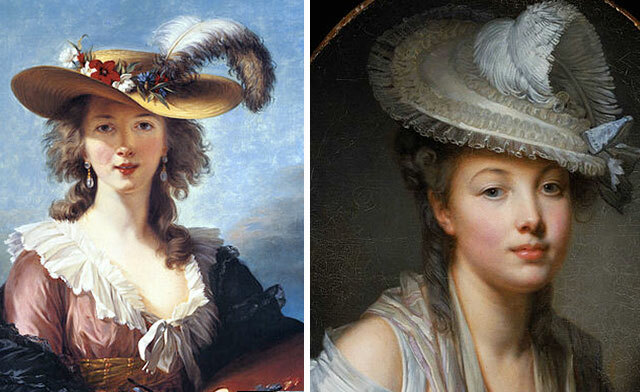 If your line will be thick you can use a pointed tip brush (see top picture). It allows to smooth the line very well. See more about eyeliner brushes in my previous post. 9. Some tips for different eye shapes: If your eyes are round and big then extend the line out more and wear it quite thick. 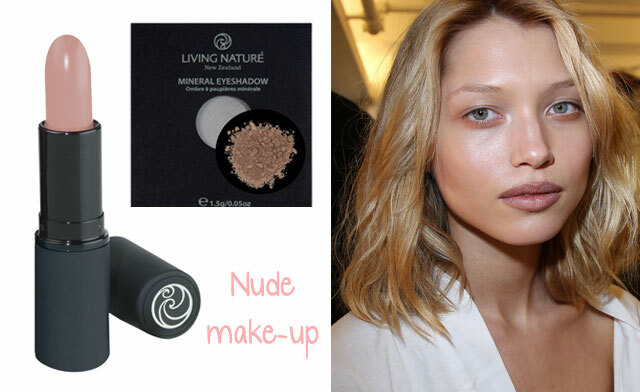 This will give you an exotic look and will elongate your eyes in an almond shape. If you have small eyes, with a hooded eyelid avoid a thick line, it will close your eyes and make them even smaller. If your eyes look sad (=corners of the eyes turned down), start to draw your wing upward a few millimeters (1-2) before the upper eyelid ends. Otherwise you will emphasize even more the droopiness. The eyes have to look lifted and not turned down. 10. Have fun even with colored eyeliners. 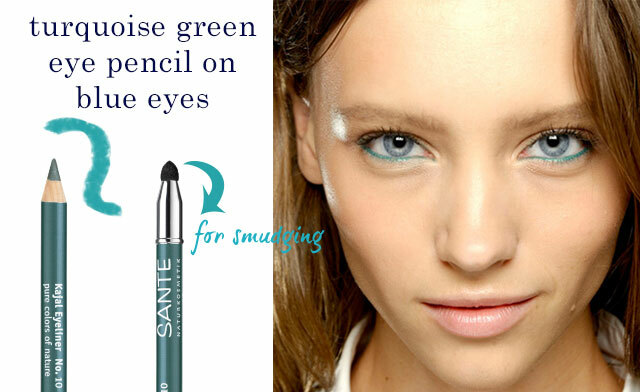 If you have brown eyes and tanned skin try with a deep green or an electric blue for instance. What kind of eyeliner do I choose? It depends on the look, texture and thickness of the line you want. Try first to draw a line on your hand with different types of eyeliner and different brushes to see and feel how the line looks like and how it glides on the skin. After experimenting decide what you want to achieve and wear.